My mother, who lives in Florida, faces a daily barrage of questions from her friends regarding my marital status. They want to know when I’m going to settle down, get married and have children. Apparently to them, as a single woman in her early 30s, I’ve been relegated to the role of eccentric spinster. As a single lady (yes, Beyonce’s anthem is currently playing in my head!) without kids I can’t imagine what it’s like to be a mom (although at times it feels like I’m a mother to my diva cat!). I have a great deal of admiration for my friends who are moms. But I don’t feel that anything is lacking in my own life by not having a family. 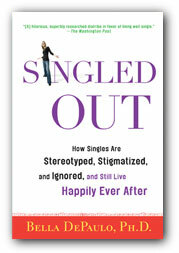 While the number of single women in America is on the rise, some in the media would have us believe otherwise. In Irina Aleksander’s recent frustrating and condescending article in the NY Observer, she argues that the U.S. is experiencing a cultural shift from feminism to “faminism;” that women are forgoing their independence and activism for babies. She manages to insult mothers and single women simultaneously, pitting the two at odds. Aleksander mentions but fails to fully appreciate that many women have grown up with the benefits and freedoms that the women’s rights movement fought to achieve. As I wrote last month, many women in my generation have taken previous generations’ struggles for granted. So it’ s not that women don’t care about issues such as equal pay or reproductive rights, but rather they don’t realize how easily our rights can be taken away. Also, being a mother and an activist are not mutually exclusive. In fact, many women (some of whom have children) become politicans because they wish to fix a problem in their community. With her diatribe on our society’s recent obsession with babies and how mothers only define themselves through motherhood, Aleksander divides women into two opposing camps: single women and mothers. First there were the “mommy wars,” pitting working mothers against stay-at-home moms. Now’s its single women against mothers. Even the outlandish Tyra Show jumped on this bandwagon last year, airing an episode with women on both sides of the debate. But it seems culturally acceptable to discuss the battle waged against mothers. In journalist Sharon Lerner’s new book “The War on Moms,” she argues that America’s policies sabotage mothers (and fathers) as the U.S. is only 1 of 4 countries that does not offer paid maternity leave. I fully support on-site daycare, parental leave, flex-time and maternity and paternity leave; you don’t have to be a mother to recognize the inherent value of strengthening policies for families. Even high-profile single women must defend their choice. In 2007, Condoleezza Rice had to defend her status to the House Foreign Affairs Committee hearing in DC when asked if she could truly “appreciate the ramifications of war” as a single woman. Janet Napolitano also faced scrutiny and snarky comments on being single when President Obama appointed her to Secretary of Homeland Security. Goff writes that one of the biggest hurdles Supreme Court Justice nominee Elena Kagan will face in her appointment will be her single status. Not all single women’s lives are lacking or incomplete; not all mothers have lost their identity or passion. I’ve said it before and I’ll say it again (it’s becoming my mantra here! ): it’s all about choice…we need to embrace diverse choices in women’s lives, not condemn them. So to all the single ladies and to those women who put a ring on it and had babies…let’s celebrate our own individual journeys. Tags: mothers, single women, women. Bookmark the permalink. From the male perspective, being in your late thirties & single, relatives assume your gay! I’ve been confused about many things in life, but my sexuality & preferences, have never been one of them. I’ve been attracted to girls since i was seven, yet the cousins & uncles from GA, think i’m hiding in the closet. I just hate being misunderstood. Some people (men & women) are just private & solitary. I can imagine the pressure & discrimination must be elevated to absurd extremes, if you happen to be female. I watch my sister, with her own children, and it’s like her entire existence revolves around what they want/need. From shuttling to soccer games, basketball games, guitar lessons, hip hop dance classes, piano lessons, the poor woman is always on the go. When i was a kid, i did one thing: Little League. When i outgrew that, i did one thing: Guitar lessons. Her kids insist on doing EVERYTHING! Maybe i’m just a shallow & selfish person, because i could never follow that route. I need ME time, and i’m sure those that have no desire to have children, understand themselves & their own personal needs. I think it’s rude for single women to endure the endless barrage of intrusive questions, when it’s truly a personal matter. @Julian, as always, you provided a humorous and insightful commentary. Keli Goff raises the issue of sexual orientation for high-profile women too…that if they’re single, they must be gay. And thank you so much for providing the male perspective on being single! Gosh I know EXACTLY how you feel! Friends and relatives are always asking the same from me! I think it’s a personal matter and people should really focus on their lives, not ours! I love cats too and I feel like I’m a mom to my cats too, hehe! Dear Opioness, the individuals who have been barraging your mother with questions about your personal life should be reminded of the Eleanor Roosevelt quote which was hung on Mr. Sullivan’s Junior High classroom wall: “Great minds discuss ideas. Average minds discuss events. Small minds discuss people.” One suggestion for an idea they can discuss: why pair a purple caftan with a red straw hat? Just a suggestion. I am disgusted by those who blast female politicians for being childless; I wish they wouldn’t pretend that they would prefer a mother as a politician. We all know they’d be just as down on a mother, wondering if she would have time to be a good mother in addition to performing this job well. Regarding the Irina Aleksander quote you posted above, I agree with you that it would be condescending to pit Fem against Fam, but when I read her actual article, and the sentence that preceded the quote you posted, I didn’t get the sense that she was trying to do that. The sentence before the quote you posted is: “Hearing Morgan talk about the pill, abortion and women’s lib is a bit like talking to a Park Slope mom about canned peas: She has been raised on the stuff and fully understands its cultural significance, but she prefers sugar snaps from the greenmarket.” This makes it sound to me like Fam is simply an educated choice on the part of the woman, which is not morally better or worse than Fem, and does not preclude activism or independence. I think the quote that Aleksander puts at the end of her article is very telling: “I think feminism is a cyclical movement. Mothers do one thing, daughters do the opposite.” It’s like how Alex P. Keaton was born to a family of hippies and ninnies…sha nanana. Fem becomes a Fam issue, and vice versa, because of the need to raise conscious children who understand the human rights issues of Fem to be something so much greater than which brand of peanut butter to buy, that it isn’t something trivial or quaint to rebel against when they get older. The crossover continues, when we get BOYS interested in women’s rights. Because as long as women’s rights are just a “women’s issue”, there will never be enough funding and lady activists to go around, and some subgroup will always be crying, “but come march with ME! THIS is more important than what YOU’RE marching for!” But the truth is that it’s all important. We all need to ovary up and honor the choices of our sisters, rise above the petty backbiting over each other’s personal choices, and stay focused on discussing ideas and events that will make the world a better place. Thank you for your detailed response, Sarah! I agree with you on many issues, particularly that people would criticize women politicians regardless of their status as a parent. However, I disagree with you regarding Irina Aleksander’s article. I found her entire tone demeaning to women. She calls stories on the pill and Roe v. Wade “themselves artifacts of another era.” While that might seem true, nothing could be further from the truth considering we are in a constant war with maintaining access to abortion in states across the country. Regarding mothers, she states that “you can’t swing a dead cat in Hollywood these days without hitting a famous Faminist,” as if celebrities only define themselves by their motherhood. She refers to proponents of Faminism as belonging to the “Faminist tribe.” She ends her inflammatory piece by writing, “In Ms. [Erica] Jong’s time, women were protesting compulsory motherhood; now, it seems, they are not protesting anything at all—they are too busy mopping up crumbs.” I find that incredibly insulting to mothers, as if their job is unimportant and they have nothing else filling their lives other than being a maid. I agree that we need to come together for feminism, which is really just code for equality. But Aleksander isn’t saying that we’ve evolved beyond feminist battles. Rather, she’s implying that women have regressed. Like I wrote in my piece, I think she’s insulting both single women and mothers in one fell swoop.